Something that sadly happens more often than it should is parents come to see me with their “child”, but their child is late teens or even early-mid twenties. They want me as the pastor to wave a magic wand over their child and fix him or her (normally a him). Sometimes they come and their son is not even with them. And the parents tell me their story, which will be that their child has not found a steady job, has not got a career, is maybe drinking or eating too much, is certainly playing their Xbox too much. These parents will love their son to pieces. I mean they will really love their boy. They will have tried a hundred different things to change their boy, they will have prayed, fasted, confessed, wept, loved, ministered, and so on. But he is still keeping bad friends, bad girlfriends and bad habits. As they talk I find out that they have given their boy everything in life. He had money at school, didn’t have to get a job – he has to revise and study, that’s important – and when their boy quit college or classes, they worked hard to find him something else to do. When I ask why isn’t their son here to see me they invariably say “He doesn’t have a problem”. And here is the fact I want you all to realize today: their son is right, he doesn’t have a problem. And I offer to help the parents give their son some problems. They don’t understand what I am saying, so I have to explain. Henry Cloud uses the following illustration: when the neighbours never water their lawn, but they put your sprinkler system in their garden, then all the watering you do makes their garden greener, but your grass turns brown. This is why we need a fence, so that people reap what they sow. Imagine being that couple’s son – you don’t need to get a job, you don’t need to study, you don’t need to plan for the future, shop for food. You have plenty of money, time and space to do exactly what you want. You have no problems! Mum and dad need to build a fence so that their son has problems and they don’t! Their child is happy, they are not. In your garden, the fences are visible, but we are talking about building invisible fences but they do the same job: they say this is your garden, this is my garden. I am responsible for mine, not yours. Your fences define what is you and not you. This revelation gives us great freedom. It shows me what I own and what I can control, and what is not mine. Imagine I asked you to do my gardening, paid you to do it, but never told you where my garden began and ended. You would fail in your task! But that is how many people are spiritually – they never delineate what belongs to them and what does not. The fruit of the spirit is self-control, not other control, so you need to learn how to draw a line. These fences help us keep the good in and the bad out. They are the way to guard your heart with all diligence, and protect the treasure inside you. We keep the pearls safe and the pigs out! God Himself has healthy fences – He is light and in Him is no darkness. God has a fence around Him that says “Darkness KEEP OUT”. To be godly we need to have fences too. God limits what He allows in His garden and we need to be the same! The most basic fence you have is your skin. In fact we often use skin as a picture of when someone crosses our invisible fences – “he gets under my skin”. Our time, our position in space, our emotions can all be used to set up fences to protect our hearts and our lives. We have much to say about this, but the key is that we use consequences to set fences with those around us. How many adult children would be happier and healthier today and be living a totally different life if mum and dad has said “no more money for you until you get a job”, “you cannot live here if you smoke weed/ bring your girlfriend to stay/ get drunk” in this house? Consequences are the barbed wire that stops people climbing our fences and putting their rubbish in our garden. Next week: backpacks, avalanches and the Good Samaritan gone wrong. We are in a series right now about dealing with difficult people. The first part is here, the second part is here and they cover knowing when to deal with people and how to deal with immature people. Today I want to introduce a simple concept, which I call the fence. The first time I preached on this in Tree of Life Dagenham was the first time I ever had a standing ovation from preaching. Understanding the power of the fence in relationships sets people free. We will spend a number of posts looking at this. Whenever you form a relationship with someone, you come together with them. You put your gardens together. The problem arises when one person continually puts their rubbish in the others garden. So you live together, but one person does all the cleaning and tidying. You are mates but one of you pays for all the drinks for the evening out. You are dating but you are the only one who calls or texts. Your children are teens now but not doing any housework or listening to you. What the fence does is provide a line that says what is yours and what is not yours. What you have to deal with and not deal with. So imagine Billy and Julie are married, and Julie spends £300 on shoes. Billy is not happy, he is annoyed. So he yells and shouts at Julie. She gets annoyed about being yelled at and storms off. Now when you put a fence up you help people realize what is theirs to deal with. Billy’s anger is not caused by Julie, it’s happening with him – that’s his garden and he needs to deal with that. No one else can make you angry. Julie’s spending problems are Julie’s problems. Now if Julie is spending Billy’s money, then Billy needs to build a fence in the money, and not let Julie have access to it if she is overspending. But he still needs to exercise self-control with his temper. 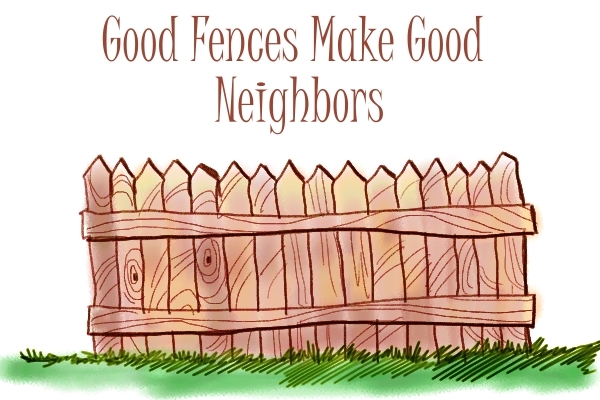 The fence helps us – it helps us know where to exercise self-control, and helps us not try and control others. How many parents are getting up in the morning running around the house trying to ensure their 15 year old children are not late for school? Let them be late a few times. A fence puts their behaviour and the consequences in the same place! You should not be continually reaping what someone else is sowing. Let the guy who goes out drinking stay outside until he sobers up. Now there is far more to it than that, fences are not walls, and should have gates. We will discuss this points as we progress, but today’s lesson is this: what is mine to change and what is not. You cannot change the behaviour of another person and to try to will lead to insanity. You can change your behaviour. You can take responsibility for your thoughts and your actions! For some further teaching on this, please click here to listen to four hours of teaching I did in our Guildford church absolutely free of charge. Last week we started a new series on how to deal with difficult people (you can read part one by clicking here) because it is something that I am asked about a lot as a pastor. It’s also something I seem to have gathered a bit of experience in through the years. Last week we discussed to know when to fight. Today, I want to help you know when to make that decision. I am going to teach you something that will help you a great deal, it is this: you cannot correct immaturity. If a two year old is having a tantrum, you cannot have an adult conversation with them about priorities and good decision making priorities. You can only feed them, nurture them and wait for the day in which they mature to that level. Pastoring and leading, and any form of dealing with difficult people, is the same. Most people in the average church are very immature. They get upset by little things. They make decisions based on base emotions, not spiritual wisdom. They don’t let the Bible get in the way of what they believe. If as a pastor or elder you tried to correct everything, you would just make the tantrums worse, run people off and cause a great fuss. You have to learn how to feed people without correcting them when they are too immature to correct. It’s not easy – you need patience and you need wisdom, and you need to know what is important and what is not. This is possibly one of the trickiest things you will ever do. You will need to understand jurisdiction (for my messages on this, please have a look at gatesofthecity.net from this year’s conference) and understand how to build a culture of honour. When people storm off, don’t chase them. The father never chased the prodigal son but waited until he grew up and developed the maturity to come home. Some people will get annoyed at you for all sorts of reasons, let them go. When people are upset for silly reasons, it can often be easy to placate them. A dear friend of mine was called by a pastor who was in terrible distress as his keyboard player would not move to the other side of the stage to play due to the plug socket placements. There was almost a riot in the church. The simple solution was an extension lead. When people are upset for silly reasons, that is a massive wake up call that you need to start maturing them. Start working your way forward with them, showing them that the love that God has for them has to flow through them. Create a progressive culture. This means you focus on the leaders and those who are superstars. Don’t spend all your time with the people who are easily offended and immature. Let them know to fit in with your church, organization, business that they need to get with the programme and grow up. Gently push people into a walk with the Lord – a life of prayer and spirit. Don’t be afraid when you see people making a silly decision, rather than correct them, ask them: have you prayed about this? What Scriptures are you basing this on? What does the Word say? Bring people back to Christ. I am going to blog for the next few weeks on something I know is dear to your heart because it is dear to everyone’s heart, and that is: how do I handle difficult people. One of the biggest keys to handling difficult people is to know when to fight and when not to fight. Jesus talks clearly about counting the cost before starting a fight. That is great wisdom which we should all take on board. I have seen many pastors start a building and never finish, I have seen many people start a fight they could never win. When David was encountered by the king of Gath he was scared of the king, and knew he could not win a direct combat against him, so David pretended to be mad to escape the fight. You see every time you fail, you demoralize the people around you. Failure, like success, creates an atmosphere. For example, there are times people have said things about me or done things to me and I could legitimately take them to court. I never will, because I know when I will not win a fight. I was once asked to appear on a large Christian TV station, and do a debate programme about healing. I was happy to do it, I believe in healing and I want the world to know about healing. But as I talked to the network and the people making the TV programme, it was clear that the adjudicator of the programme was anti-healing. He kept calling me a fanatic, an extremist, and so on. Listen – I am not about to waste my time playing a game of football when the referee is a player for the other team. You will be off-side every time you are about to score. You will get penalties against you for no reason. I bowed out, I have other things to do with my time! One of the battles that is very rarely one is the winning over of a betrayer. Jesus never went to counsel Judas Iscariot. It wasn’t worthy of His time. When someone wants to leave our church or resign, I will not ask questions, I will not try and change someone’s mind over an issue like that. It is a waste of our time.